Welcome to my Teluk Intan Attractions page. 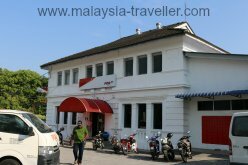 Teluk Intan is a town in the Hilir Perak district of south west Perak state, on the banks of the mighty Perak River. According to Wikipedia it has a population of 120,000 but it seems much smaller. Certainly the town centre area, which is almost surrounded by a giant loop in the river, has a small town feel to it. The town used to be called Teluk Anson, in honour of the British official who helped to establish it in the 1880s. 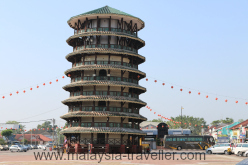 The town is most famous for its pagoda shaped clock tower, nicknamed the Leaning Tower of Teluk Intan due to its definite tilt. 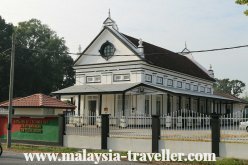 Those tourists who make the effort to come to Teluk Intan usually take a look at the leaning tower and leave but there are more heritage buildings and places of interest for lovers of history and they are mostly located in a compact area of the town centre which can easily be covered on foot. We'll start our walking tour at the War Memorial stone on a traffic island in the centre of town. The plinth is inscribed 'At the going down of the sun and in the morning we will remember them. 1914 - 1918 'and a later addition '1939-1945'. 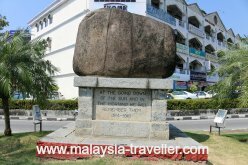 Since there is no list of Teluk Intan's casualties in those wars on the monument we can only remember them in general terms. Next is the former Court House building which was built in 1880 and used as a court until 1983. On Sundays the building doubled-up as a church until St.Luke's was built in 1911. It now appears to have been taken over by the Army which is a good thing as they usually know how to look after and preserve heritage buildings. 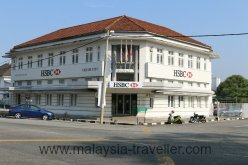 On the opposite corner stands the Teluk Intan branch of HSBC Bank. The exterior is virtually unchanged since the branch opened shortly after WWII ended. Next door is one of the better preserved post offices in the country. The old inscription of 'Pejabat Pos' can still be seen above the awning at the entrance. The former police station is one of the oldest buildings in town. It started out life as the Customs Office standing opposite the jetty where goods would have been loaded and unloaded. It now looks abandoned and in danger of being demolished. The market and food stall complex is overlooked by the Leaning Tower which I have written about in detail elsewhere (click here). The grid pattern streets surrounding the Leaning Tower are lined with traditional shophouses with plenty of Kedai Kopi shops to take refreshment. 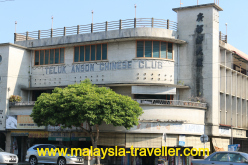 The Teluk Anson Chinese Club building still bears the old name of the town. 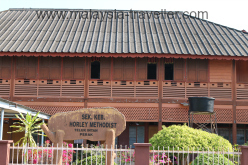 In Jalan Raja Musa, The Horley Methodist School's historic original building dates from 1899. Round the corner is the Roman Catholic St. Anthony of Padua. A plaque outside says the present church was opened on 6th May 1923. 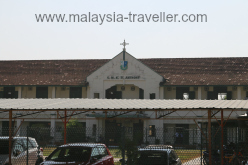 The convent school is located next door. 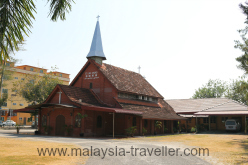 Back on Jalan Bandar can be found the Nagarathar Sri Thendayuthapani Temple which was built by the Chettiar community in 1899. 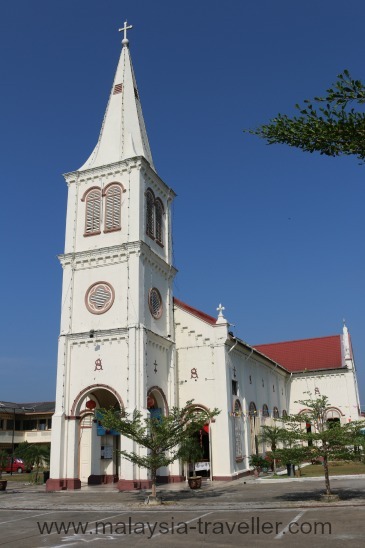 St. Luke the Evangelist is an Anglican church consecrated in 1912. At the time it was described by the press as 'a very graceful structure and the interior is nicely though plainly furnished'. 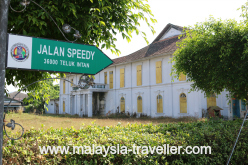 The next turning is into Jalan Speedy, a street presumably named after Captain Speedy whose house can still be visited in Matang. See my blog for details. 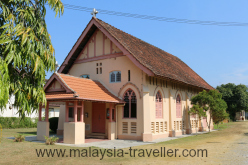 This street is lined with some grand old houses and also the Methodist Tamil Church, dating from 1936. 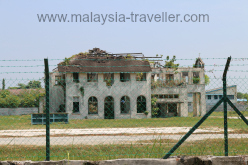 Not far from here are the ruins of Raja Muda's Palace which some believe to be haunted. It looks ripe for demolition. 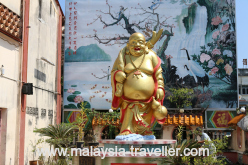 Down near the waterfront on Jalan Pasar is the Hock Soon Temple, built by the Hokkien community in 1883. 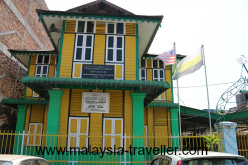 Opposite is a traditional wooden Malay building housing the Madrasah Al Ihsaniah (an Islamic school) inscribed with the date 1901. This completes my list of Teluk Intan Attractions but for railway enthusiasts I have posted some more photos relating to the former railway station which can be seen on my Great Malaysian Railway Journeys website. Too much to see in Teluk Intan in one day? There are a few hotels here to choose from. Take a look at Agoda's website for a list of available rooms at discounted rates.